If you have saved this file to your computer, click on a link in the contents to go to that section. This guide is meant as a supplement to a year long freshman level physics course with a trigonometry prerequisite. Some ideas from calculus are included in the book but are not necessary to understand the content. The overview of equations and definitions and eventually sample problem solutions are pertinent to an introductory, college-level physics course suitable for pre-meds. This is not a stand alone textbook rather the intent is to help the student and any other interested person quickly familiarize themselves with concepts and terminology so as to use the appropriate equations to get the desired answers to physics problems. Everyone is encouraged to contribute to the guide. Be bold in your edits! If you have a question about how we do things here look at the Style Guide or post your question on the talk page. This guide is meant as a supplement to a year long freshman level physics course with a trigonometry prerequisite suitable for pre-meds. This is not a stand alone textbook. The intent is to help the student and any other interested person quickly familiarize themselves with concepts and terminology. A Wikibookian suggests that Physics Exercises be merged into this book or chapter. A Wikibookian suggests that Force_in_motion be merged into this book or chapter. These are basic units upon which most units depends. Time is defined as the duration between two events. In the international system of measurement (S.I.) the second (s) is the basic unit of time and it is defined as the time it takes a cesium (Cs) atom to perform 9,192,631,770 complete oscillations. The Earth revolves around its own axis in 86400 seconds with respect to the Sun; this is known as 1 day, and the 86400th part of one day is known as a second. In the international system of measurement (S.I.) the metre (m) ('meter' in the US) is the basic unit of length and is defined as the distance travelled by light in a vacuum in 1/299,792,458 second. This definition establishes that the speed of light in a vacuum is precisely 299,792,458 metres per second. In the international system of measurement (S.I.) the kilogram (kg) is the basic unit of mass and is defined as the mass of a specific platinum-iridium alloy cylinder kept at the Bureau International des Poids et Mesures in Sèvres, France. A duplicate of the Sèvres cylinder is kept at the National Institute of Standards and Technology (NIST) in Gaithersburg, Maryland. See Wikipedia article. In the international system of measurement (S.I.) the ampere (A) is the basic measure of electrical current. It is defined as the constant current which, if maintained in two straight parallel conductors of infinite length, of negligible circular cross-section, and placed 1 metre (m) apart in vacuum, would produce between these conductors a force equal to 2×10-7 newton (N) per metre of length. The kelvin (K), unit of thermodynamic temperature, is the fraction 1/273.16 of the thermodynamic temperature of the triple point of water. 1. The mole (mol) is the amount of substance of a system which contains as many elementary entities as there are atoms in 0.012 kilogram of carbon 12. These are units obtained by combining two or more fundamental units. The SI unit for velocity is in m/s or metres per second. The SI unit of energy is the joule (J). The joule has base units of kg·m²/s² = N·m. A joule is defined as the work done or energy required to exert a force of one newton for a distance of one metre. See Wikipedia article. The Julian year is defined by the IAU as exactly 365.25 days, a day being exactly 60*60*24 = 86,400 SI seconds. The Julian year is therefore equal to 31,557,600 seconds. The Astronomical Unit (au or ua), often used for measuring distances in the Solar system, is the average distance from the Earth to the Sun. It is 149,597,870,691 m, ± 30 m, as currently defined. The light year (ly) is defined as the distance light travels in a homogeneous isotopic non-attenuating medium (a vacuum) in one Julian year. Due to the word "year", the light year is often mistaken for a unit of time in popular culture. It is, however, a unit of length (distance), and is equal to exactly 9,460,730,472,580,800 m.
The parsec (pc), or "parallax second", is the distance of an object that appears to move two arc-seconds against the background stars as the Earth moves around the sun, or by definition one arc-second of parallax angle. This angle is measured in reference to a line connecting the object and the Sun, and thus the apparent motion is one arc-second on either side of this "central" position. The parsec is approximately 3.26156 ly. Kinematics is the description of motion. The motion of a point particle is fully described using three terms - position, velocity, and acceleration. For real objects (which are not mathematical points), translational kinematics describes the motion of an object's center of mass through space, while angular kinematics describes how an object rotates about its centre of mass. In this section, we focus only on translational kinematics. Position, displacement, velocity, and acceleration are defined as follows. "Position" is a relative term that describes the location of an object RELATIVE to some chosen stationary point that is usually described as the "origin". A vector is a quantity that has both magnitude and direction, typically written as a column of scalars. That is, a number that has a direction assigned to it. In physics, a vector often describes the motion of an object. For example, Warty the Woodchuck goes 10 meters towards a hole in the ground. We can divide vectors into parts called "components", of which the vector is a sum. For example, a two-dimensional vector is divided into x and y components. Displacement answers the question, "Has the object moved?" gives a step by step procedure for determining displacement. Measure where the object is initially. Measure where the object is at some later time. Determine the difference between these two position values. Be sure to note that displacement is not the same as distance travelled. For example, imagine travelling one time along the circumference of a circle. If you end where you started, your displacement is zero, even though you have clearly travelled some distance. In fact, displacement is an average distance travelled. On your trip along the circle, your north and south motion averaged out, as did your east and west motion. Clearly we are losing some important information. The key to regaining this information is to use smaller displacement intervals. For example, instead of calculating your displacement for your trip along the circle in one large step, consider dividing the circle into 16 equal segments. Calculate the distance you travelled along each of these segments, and then add all your results together. Now your total travelled distance is not zero, but something approximating the circumference of the circle. Is your approximation good enough? Ultimately, that depends on the level of accuracy you need in a particular application, but luckily you can always use finer resolution. For example, we could break your trip into 32 equal segments for a better approximation. to indicate that small enough displacement steps have been used to provide a good enough approximation for the true distance travelled. [Δ, delta, upper-case Greek D, is a prefix conventionally used to denote a difference.] Velocity answers the question "Is the object moving now, and if so - how quickly?" Once again we have an operational definition: we are told what steps to follow to calculate velocity. Note that this is a definition for average velocity. The displacement Δx is the vector sum of the smaller displacements which it contains, and some of these may subtract out. By contrast, the distance travelled is the scalar sum of the smaller distances, all of which are non-negative (they are the magnitudes of the displacements). Thus the distance travelled can be larger than the magnitude of the displacement, as in the example of travel on a circle, above. Consequently, the average velocity may be small (or zero, or negative) while the speed is positive. Acceleration answers the question "Is the object's velocity changing, and if so - how quickly?" Once again we have an operational definition. We are told what steps to follow to calculate acceleration. just reminds us that velocity is a vector, and does not imply that this particular velocity is rightward. The object could be speeding up. The object could be slowing down. The object could be traveling at constant speed, while changing its direction of motion. More general accelerations are simply combinations of 1 and 3 or 2 and 3. Importantly, a change in the direction of motion is just as much an acceleration as is speeding up or slowing down. If the velocity and acceleration of an object point in the same direction, the object's speed is increasing. If the velocity and acceleration of an object point in opposite directions, the object's speed is decreasing. If the velocity and acceleration of an object are perpendicular to each other, the object's initial speed stays constant (in that initial direction), while the speed of the object in the direction of the acceleration increases. Think of a bullet fired horizontally in a vertical gravitational field. Since velocity in the one direction remains constant, and the velocity in the other direction increases, the overall velocity (absolute velocity) also increases. Again, more general motion is simply a combination of 1 and 3 or 2 and 3. Using these three simple rules will dramatically help your intuition of what is happening in a particular problem. In fact, much of the first semester of college physics is simply the application of these three rules in different formats. Since acceleration is a vector, constant acceleration means that both direction and magnitude of this vector don't change during the motion. This means that average and instantaneous acceleration are equal. We can use that to derive an equation for velocity as a function of time by integrating the constant acceleration. Giving the following equation for velocity as a function of time. To derive the equation for position we simply integrate the equation for velocity. Integrating again gives the equation for position. The following equations can be derived from the two equations above by combining them and eliminating variables. This is because the module itself describes a small chapter already made in another module. What does force in motion mean? How do we calculate the speed? This is an easy formula to use, you can find the distance travelled, time taken or average speed, you need at least 2 values to find the whole answer. Is velocity the same thing as speed? Speed is measured in the same physical units of measurement as velocity, but does not contain an element of direction. Speed is thus the magnitude component of velocity. Velocity contains both the magnitude and direction components. You can think of velocity as the displacement/duration, whereas speed can be though as distance/duration. When a car is speeding up we say that it is accelerating, when it slows down we say it is decelerating. When we want to calculate it, the method goes like that: A lorry driver brakes hard, and slows from 25 m/s to 5 m/s in 5 seconds. What was the vehicle's acceleration? What is initial velocity and final velocity? Initial velocity is the beginning before motion starts or in the middle of the motion, final velocity is when the motion stops. There is another way to calculate it and it is like that This equations which are written is the primary ones, which means that when you don’t have lets say final velocity, how will you calculate the equation? This is the way you are going to calculate. When you want to know how fast an athletic person is running, what you need is a stopwatch in your hand, then when the person starts to run, you start the stopwatch and when the person who is sprinting stops at the end point, you stop the watch and see how fast he ran, and if you want to see if the athlete is wasting his energy, while he is running look at his movement, and you will know by that if he is wasting his energy or not. This athletic person is running, and while he is running the scientist could know if he was wasting his energy if they want by the stop watch and looking at his momentum. Take a slope, a trolley, some tapes and a stop watch, then put the tapes on the slope and take the trolley on the slope, and the stopwatch in your hand, as soon as you release the trolley, start timing the trolley at how fast it will move, when the trolley stops at the end then stop the timing. After wards, after seeing the timing , record it, then you let the slope a little bit high, and you will see, how little by little it will decelerate. Isaac Newton was an English physicist, mathematician (described in his own day as a "natural philosopher") , astronomer and alchemist. Newton is one of the most influential scientists of all time, and he is known, among other things, for contributing to development of classical mechanics and for inventing, independently from Gottfried Leibniz, calculus. Newton is also known by his three laws of motion, which describe the relationship between a body and the forces acting upon it, and its motion in response to said forces. First Law (also known as the law of inertia) states that every body continues in its state of rest or state of uniform motion unless compelled to change that state by being subject to an external force. The moment of inertia is defined as the tendency of matter to resist any change in its state of motion or state of rest. Third Law states that when one body exerts a force on a second body, the second body simultaneously exerts a force equal in magnitude and opposite in direction on the first body. How to calculate the force? is the acceleration. Note that the Newton’s second law is defined as a numerical measure of inertia. Inertia is the tendency of a body to maintain its state of rest or uniform motion, unless acted upon by an external force. Robert Hooke was an English polymath who played an important role in the scientific revolution, through both experimental and theoretical work. is a constant factor characteristic of the spring, its stiffness. Momentum is equal to mass times velocity. Angular momentum of a rotating object is equal to the moment of inertia times angular velocity. Net force is equal to the change in linear momentum over the change in time. Net torque is equal to the change in angular momentum over the change in time. Let us prove this law. This means that the sum of the momentums does not change with time. Therefore, the law is proved. Bold denotes a vector quantity. Italics denotes a scalar quantity. Isolated system: A system in which there are no external forces acting on the system. Force is equal to the derivative of linear momentum with respect to time. Torque is equal to the derivative of angular momentum with respect to time. Why is it that we stay steady in our chairs when we sit down? According to the first law of motion, if an object is translationally in equilibrium (velocity is constant), the sum of all the forces acting on the object must be equal to zero. For a person sitting on a chair, it can thus be postulated that a normal force is present balancing the gravitational force that pulls the sitting person down. However, it should be noted that only some of the normal force can cancel the other forces to zero like in the case of a sitting person. In Physics, the term normal as a modifier of the force implies that this force is acting perpendicular to the surface at the point of contact of the two objects in question. Imagine a person leaning on a vertical wall. Since the person does not stumble or fall, he/she must be in equilibrium. Thus, the component of his/her weight along the horizontal is balanced or countered (opposite direction) by an equal amount of force -- this force is the normal force on the wall. So, on a slope, the normal force would not point upwards as on a horizontal surface but rather perpendicular to the slope surface. The normal force can be provided by any one of the four fundamental forces, but is typically provided by electromagnetism since microscopically, it is the repulsion of electrons that enables interaction between surfaces of matter. There is no easy way to calculate the normal force, other than by assuming first that there is a normal force acting on a body in contact with a surface (direction perpendicular to the surface). If the object is not accelerating (for the case of uniform circular motion, the object is accelerating) then somehow, the magnitude of the normal force can be solved. In most cases, the magnitude of the normal force can be solved together with other unknowns in a given problem. Sometimes, the problem does not warrant the knowledge of the normal force(s). It is in this regard that other formalisms (e.g. Lagrange method of undertermined coefficients) can be used to eventually solve the physical problem. When there is relative motion between two surfaces, there is a resistance to the motion. This force is called friction. Friction is the reason why people could not accept Newton's first law of Motion, that an object tends to keep its state of motion. Friction acts opposite to the direction of the original force. The frictional force is equal to the frictional coefficient times the normal force. Friction is caused due to attractive forces between the molecules near the surfaces of the objects. If two steel plates are made really flat and polished and cleaned and made to touch in a vacuum, it bonds together. It would look as if the steel was just one piece. The bonds are formed as in a normal steel piece. This is called cold welding. And this is the main cause of friction. The above equation is an empirical one--in general, the frictional coefficient is not constant. However, for a large variety of contact surfaces, there is a well characterized value. This kind of friction is called Coulomb friction. There is a separate coefficient for both static and kinetic friction. This is because once an object is pushed on, it will suddenly jerk once you apply enough force and it begins to move. Also, the frictional coefficient varies greatly depending on what two substances are in contact, and the temperature and smoothness of the two substances. For example, the frictional coefficients of glass on glass are very high. When you have similar materials, in most cases you don't have Coulomb friction. The static frictional force is less than or equal to the coefficient of static friction times the normal force. Once the frictional force equals the coefficient of static friction times the normal force, the object will break away and begin to move. It's important to note, that in real life we often have to deal with viscose and turbulent friction - they appear when you move the body through the matter. and takes place at higher velocities. Work is equal to the scalar product of force and displacement. The scalar product of two vectors is defined as the product of their lengths with the cosine of the angle between them. Work is equal to force times displacement times the cosine of the angle between the directions of force and displacement. Work is equal to change in kinetic energy plus change in potential energy for example the potential energy due to gravity. Work is equal to average power times time. Work is in fact just a transfer of energy. When we 'do work' on an object, we transfer some of our energy to it. This means that the work done on an object is its increase in energy. Actually, the kinetic energy and potential energy is measured by calculating the amount of work done on an object. The gravitational potential energy (there are many types of potential energies) is measured as 'mgh'. mg is the weight/force and h is the distance. The product is nothing but the work done. Even kinetic energy is a simple deduction from the laws of linear motion. Try substituing for v^2 in the formula for kinetic energy. When work is applied to an object or a system it adds or removes kinetic energy to or from that object or system. More precisely, a net force in one direction, when applied to an object moving opposite or in the same direction as the force, kinetic energy will be added or removed to or from that object. Note that work and energy are measured in the same unit, the joule (J). Kinetic energy is simply the capacity to do work by virtue of motion. (Translational) kinetic energy is equal to one-half of mass times the square of velocity. (Rotational) kinetic energy is equal to one-half of moment of inertia times the square of angular velocity. Total kinetic energy is simply the sum of the translational and rotational kinetic energies. In most cases, these energies are separately dealt with. It is easy to remember the rotational kinetic energy if you think of the moment of inertia I as the rotational mass. However, you should note that this substitution is not universal but rather a rule of thumb. Potential energy is simply the capacity to do work by virtue of position (or arrangement) relative to some zero-energy reference position (or arrangement). Potential energy due to gravity is equal to the product of mass, acceleration due to gravity, and height (elevation) of the object. Note that this is simply the vertical displacement multiplied by the weight of the object. The reference position is usually the level ground but the initial position like the rooftop or treetop can also be used. Potential energy due to spring deformation is equal to one-half the product of the spring constant times the square of the change in length of the spring. , it is instructive to need a "correction factor" during integration. Energy: a theoretically indefinable quantity that describes potential to do work. SI unit for energy is the joule (J). Also common is the calorie (cal). The joule: defined as the energy needed to push with the force of one newton over the distance of one meter. Equivalent to one newton-meter (N·m) or one watt-second (W·s). Energy comes in many varieties, including Kinetic energy, Potential energy, and Heat energy. is the time period for one revolution. is the angular coordinate of the object (see the diagram on the right-hand side for reference). , is commonly referred to as phase. The acceleration vector is perpendicular to the velocity and oriented towards the centre of the circular trajectory. For that reason, acceleration in circular motion is referred to as centripetal acceleration. If Stone ties a piece of thread to a small pebble and rotates it in a horizontal circle above his head, the circular motion of the pebble is caused by the tension force in the thread. In the case of the motion of the planets around the sun (which is roughly circular), the force is provided by the gravitational force exerted by the sun on the planets. Thus, we see that the centripetal force acting on a body is always provided by some other type of force -- centripetal force, thus, is simply a name to indicate the force that provides this circular motion. This centripetal force is always acting inward toward the center. You will know this if you swing an object in a circular motion. If you notice carefully, you will see that you have to continuously pull inward. We know that an opposite force should exist for this centripetal force(by Newton's 3rd Law of Motion). This is the centrifugal force, which exists only if we study the body from a non-inertial frame of reference(an accelerating frame of reference, such as in circular motion). This is a so-called 'pseudo-force', which is used to make the Newton's law applicable to the person who is inside a non-inertial frame. e.g. If a driver suddenly turns the car to the left, you go towards the right side of the car because of centrifugal force. The centrifugal force is equal and opposite to the centripetal force. It is caused due to inertia of a body. Average angular velocity is equal to one-half of the sum of initial and final angular velocities assuming constant acceleration, and is also equal to the angle gone through divided by the time taken. Angular acceleration is equal to change in angular velocity divided by time taken. Rotational Kinetic Energy is equal to one-half of the product of moment of inertia and the angular velocity squared. the place of linear velocity, momentum, acceleration, etc. is taken by their angular counterparts. Buoyancy is the force due to pressure differences on the top and bottom of an object under a fluid (gas or liquid). The fluid flow is steady i.e its velocity at each point is constant with time. The fluid is incompressible. This condition applies well to liquids and in certain circumstances to gases. The fluid flow is non-viscous. Internal friction is neglected. An object moving through this fluid does not experience a retarding force. We relax this condition in the discussion of Stokes' Law. The fluid flow is irrotational. There is no angular momentum of the fluid about any point. A very small wheel placed at an arbitrary point in the fluid does not rotate about its center. Note that if turbulence is present, the wheel would most likely rotate and its flow is then not irrotational. As the fluid moves through a pipe of varying cross-section and elevation, the pressure will change along the pipe. The Swiss physicist Daniel Bernoulli (1700-1782) first derived an expression relating the pressure to fluid speed and height. This result is a consequence of conservation of energy and applies to ideal fluids as described above. ), the kinetic energy per unit volume and the potential energy per unit volume remains a constant. A field is one of the more difficult concepts to grasp in physics. A field is an area or region in which an influence or force is effective regardless of the presence or absence of a material medium. Simply put, a field is a collection of vectors often representing the force an object would feel if it were placed at any particular point in space. With gravity, the field is measured in newtons, as it depends solely on the mass of an object, but with electricity, it is measured in newtons per coulomb, as the force on an electrical charge depends on the amount of that charge. Typically these fields are calculated based on canceling out the effect of a body in the point in space that the field is desired. As a result, a field is a vector, and as such, it can (and should) be added when calculating the field created by TWO objects at one point in space. Fields are typically illustrated through the use of what are called field lines or lines of force. Given a source that exerts a force on points around it, sample lines are drawn representing the direction of the field at points in space around the force-exerting source. Uniform fields are fields that have the same value at any point in space. As a result, the lines of force are parallel. Spherical fields are fields that have an origin at a particular point in space and vary at varying distances from that point. Complex fields are fields that are difficult to work with mathematically (except under simple cases, such as fields created by two point object), but field lines can still typically be drawn. Dipoles are a specific kind of complex field. Magnetism also has a field, measured in Tesla, and it also has field lines, but its use is more complicated than simple "force" fields. Secondly, it also only appears in a two-pole form, and as such, is difficult to calculate easily. The particles that form these magnetic fields and lines of force are called electrons and not magnetons. A magneton is a quantity in magnetism. Field: A collection of vectors that often represents the force that an object would feel if it were placed in any point in space. Field Lines: A method of diagramming fields by drawing several sample lines showing direction of the field through several points in space. Newtonian Gravity (simplified gravitation) is an apparent force (a.k.a. pseudoforce) that simulates the attraction of one mass to another mass. Unlike the three fundamental (real) forces of electromagnetism and the strong and weak nuclear forces, gravity is purely attractive. As a force it is measured in newtons. The distance between two objects is measured between their centers of mass. Gravitational force is equal to the product of the universal gravitational constant and the masses of the two objects, divided by the square of the distance between their centers of mass. The value of the gravitational field which is equivalent to the acceleration due to gravity caused by an object at a point in space is equal to the first equation about gravitational force, with the effect of the second mass taken out. Potential energy due to gravity near the earth's surface is equal to the product of mass, acceleration due to gravity, and height (elevation) of the object. Universal constant of gravitation (G): This is a constant that is the same everywhere in the known universe and can be used to calculate gravitational attraction and acceleration due to gravity. Mass one (m1): One of two masses that are experiencing a mutual gravitational attraction. We can use this for the mass of the Earth (1023 kg). Mass two (m2): One of two masses that are experiencing a mutual gravitational attraction. This symbol can represent the mass of an object on or close to earth. Escape velocity (vesc): The velocity necessary to completely escape the gravitational effects of a body. A black hole is a geometrically defined region of space time exhibiting such large centripetal gravitational effects that nothing such as particles and electromagnetic radiation such as light may escape from inside of it. That is the escape velocity upon the event horizon is equivalent to the speed of light. General relativity is a metric theory of gravitation generalizing space time and Newton's law of universal gravitational attraction as a geometric property of space time. Wave is defined as the movement of any periodic motion like a spring, a pendulum, a water wave, an electric wave, a sound wave, a light wave, etc. Wavelength (distance between two crests) λ = 2π. Wave speed is equal to the frequency times the wavelength. It can be understood as how frequently a certain distance (the wavelength in this case) is traversed. Frequency is equal to speed divided by wavelength. Period is equal to the inverse of frequency. Frequency of oscillation (f) (or just frequency): the number of times the wave pattern repeats itself in one second. Units: seconds-1 = (1/s) = hertz (Hz) In sound, f tells us the pitch. The inverse of frequecy is the period of oscillation. Period of oscillation (T) (or just period): duration of time between one wave and the next one passing the same spot. Units: seconds (s). The inverse of the period is frequency. Use a capital, italic T and not a lowercase one, which is used for time. The wave’s extremes, its peaks and valleys, are called antinodes. At the middle of the wave are points that do not move, called nodes. A wave is said to oscillate, which means to move back and forth in a regular, repeating way. This fluctuation can be between extremes of position, force, or quantity. Different types of waves have different types of oscillations. Longitudinal waves: Oscillation is parallel to the direction of the wave. Examples: sound waves, waves in a spring. When waves overlap each other it is called interference. This is divided into constructive and destructive interference. Constructive interference: the waves line up perfectly and add to each others’ strength. Destructive interference: the two waves cancel each other out, resulting in no wave. In real life, waves usually give a mishmash of constructive and destructive interference and quickly die out. However, at certain wavelengths standing waves form, resulting in resonance. These are waves that bounce back into themselves in a strengthening way, reaching maximum amplitude. Resonance is a special case of forced vibration when the frequency of the impressed periodic force is equal to the natural frequency of the body so that it vibrates with increased amplitude, spontaneously. For resonance in a taut string, the first harmonic is determined for a wave form with one antinode and two nodes. That is, the two ends of the string are nodes because they do not vibrate while the middle of the string is an antinode because it experiences the greatest change in amplitude. This means that one half of a full wavelength is represented by the length of the resonating structure. The wavelength of the first harmonic is equal to double the length of the string. The "nth" wavelength is equal to the fundamental wavelength divided by n.
* or any wave system with two identical ends, such as a pipe with two open or closed ends. In the case of a pipe with two open ends, there are two antinodes at the ends of the pipe and a single node in the middle of the pipe, but the mathematics work out identically. Fundamental frequency, first harmonic (F)1: The lowest frequency (longest wavelength) allowed for the system. Length of string (L): (or pipe, etc.) Units: meters (m). Wavelength (λ): Units: meters (m). The first overtone is the first allowed harmonic above the fundamental frequency (F1). In the case of a system with two different ends (as in the case of a tube open at one end), the closed end is a node and the open end is an antinode. The first resonant frequency has only a quarter of a wave in the tube. This means that the first harmonic is characterized by a wavelength four times the length of the tube. The wavelength of the first harmonic is equal to four times thelength of the string. Note that "n" must be odd in this case as only odd harmonics will resonate in this situation. †In this case only the odd harmonics resonate, so n is an odd integer. dependent on qualities of the medium transmitting the sound, (the air) such as its density, temperature, and “springiness.” A complicated equation, we concentrate only on temperature. for “room air” is 340 meters per second (m/s). Speed of sound is 343 meters per second at 20 degrees C. Based on the material sound is passing through and the temperature, the speed of sound changes. Wave speed is equal to the square root of tension divided by the linear density of the string. Linear density of the string is equal to the mass divided by the length of the string. The fundamental wavelength is equal to two times the length of the string. Mass (m): Units: grams (g). (We would use kilograms but they are too big for most strings). Fundamental frequency: the frequency when the wavelength is the longest allowed, this gives us the lowest sound that we can get from the system. In a string, the length of the string is half of the largest wavelength that can create a standing wave, called its fundamental wavelength. Sound is defined as mechanical sinosodial vibratory longitudinal impulse waves which oscillate the pressure of a transmitting medium by means of adiabatic compression and decompression consequently resulting in the increase in the angular momentum and hence rotational kinetic energy of the particles present within the transmitting medium producing frequencies audible within hearing range, that is between the threshold of audibility and the threshold of pain on a Fletchford Munson equal loudness contour diagram. When two glasses collide, we hear a sound. When we pluck a guitar string, we hear a sound. Different sounds are generated from different sources. Generally speaking, the collision of two objects results in a sound. Sound does not exist in a vacuum; it travels through the materials of a medium. Sound is a longitudinal wave in which the mechanical vibration constituting the wave occurs along the direction of the wave's propagation. The velocity of sound waves depends on the temperature and the pressure of the medium. For example, sound travels at different speeds in air and water. We can therefore define sound as a mechanical disturbance produced by the collision of two or more physical quantities from a state of equilibrium that propagates through an elastic material medium. Fig. 1: The Fletcher-Munson equal-loudness contours. Phons are labelled in blue. The amplitude is the magnitude of sound pressure change within a sound wave. Sound amplitude can be measured in pascals (Pa), though its more common to refer to the sound (pressure) level as Sound intensity(dB,dBSPL,dB(SPL)), and the percieved sound level as Loudness(dBA, dB(A)). Sound intensity is flow of sound energy per unit time through a fixed area. It has units of watts per square meter. The reference Intensity is defined as the minimum Intensity that is audible to the human ear, it is equal to 10-12 W/m2, or one picowatt per square meter. When the intensity is quoted in decibels this reference value is used. Loudness is sound intensity altered according to the frequency response of the human ear and is measured in a unit called the A-weighted decibel (dB(A), also used to be called phon). , where x is a squared quantity, ie pressure squared, volts squared etc. The decibel is useful to define relative changes. For instance, the required sound decrease for new cars might be 3 dB, this means, compared to the old car the new car must be 3 dB quieter. The absolute level of the car, in this case, does not matter. where log is the base-10 logarithm. is the speed of the source. If the observer is approaching the source, use the top operator (the +) in the numerator, and if the source is approaching the observer, use the top operator (the -) in the denominator. If the observer is moving away from the source, use the bottom operator (the -) in the numerator, and if the source is moving away from the observer, use the bottom operator (the +) in the denominator. A. An ambulance, which is emitting a 400 Hz siren, is moving at a speed of 30 m/s towards a stationary observer. The speed of sound in this case is 339 m/s. B. An M551 Sheridan, moving at 10 m/s is following a Renault FT-17 which is moving in the same direction at 5 m/s and emitting a 30 Hz tone. The speed of sound in this case is 342 m/s. Thermodynamics deals with the movement of heat and its conversion to mechanical and electrical energy among others.
) equals the amount of energy added to a system (Q), such as heat, minus the work expended by the system on its surroundings (W). If Q is positive, the system has gained energy (by heating). If W is positive, the system has lost energy from doing work on its surroundings. As written the equations have a problem in that neither Q or W are state functions or quantities which can be known by direct measurement without knowing the history of the system. After the first law of Thermodynamics had been named, physicists realised that there was another more fundamental law, which they termed the 'zero-th'. If two bodies are at the same temperature, there is no resultant heat flow between them. If two bodies are in thermal equilibrium with a third, all are in thermal equilibrium with each other. Temperature is the only thing that is the same between two otherwise unlike bodies that are in thermal equilibrium with each other. This law states that heat will never of itself flow from a cold object to a hot object. is the partition function, i. e. the number of all possible states in the system. where T is the temperature and dQ is the increment in energy of the system. The third law states that a temperature of absolute zero cannot be reached. There are several different scales used to measure temperature. Those you will most often come across in physics are degrees Celsius and kelvins. Celsius temperatures use the symbol Θ. The symbol for degrees Celsius is °C. Kelvin temperatures use the symbol T. The symbol for kelvins is K.
The Celsius scale is based on the melting and boiling points of water. The temperature of boiling water is 100 °C. This is called the steam point. The Celsius scale is sometimes known as 'Centigrade', but the CGPM chose degrees Celsius from among the three names then in use way back in 1948, and centesimal and centigrade should no longer be used. See Wikipedia for more details. Although the Kelvin scale starts at a different point to Celsius, its units are of exactly the same size. Energy is needed to break bonds when a substance changes state. This energy is sometimes called the latent heat. Temperature remains constant during changes of state. The specific latent heat, L, is the energy needed to change the state of 1 kg of the substance without changing the temperature. The latent heat of fusion refers to melting. The latent heat of vapourisation refers to boiling. The specific heat capacity is the energy needed to raise the temperature of a given mass by a certain temperature. The change in temperature of a substance being heated or cooled depends on the mass of the substance and on how much energy is put in. However, it also depends on the properties of that given substance. How this affects temperature variation is expressed by the substance's specific heat capacity (c). This is measured in J/(kg·K) in SI units. The magnetic force exerted on a moving particle in a magnetic field is the cross product of the magnetic field and the velocity of the particle, multiplied by the charge of the particle. The radius of this circle is directly proportional to the mass and the velocity of the particle and inversely proportional to the charge of the particle and the field strength of the magnetic field. The period and frequency of this motion (referred to as the cyclotron period and frequency) can be derived as well. , multiplied by the current flowing through the wire and divide by the distance from the wire. , multiplied by the dipole moment divided by the cube of the distance from the dipole. EDIT: This forumla is incomplete. The field from a dipole is a vector that depends not only on the distance from the dipole, but also the angle relative to the orientation of the magnetic moment. This is because of the vector nature of the magnetic moment and its associated magnetic field. The field component pointing in the same directions as the magnetic moment is the above formula multiplied by (3*(Cos[theta])^2-1). , times the number of turns of the solenoid times the current flowing through the solenoid. , times the number of turns of the toroid times the current flowing through the toroid divided by the circumference of the toroid. , times the current in one wire times the current in the other wire times the length of the wires divided by the distance between the wires. The torque on a current loop in a magnetic field is equal to the cross product of the magnetic field and the area enclosed by the current loop (the area vector is perpendicular to the current loop). The dipole moment of a current loop is equal to the current in the loop times the area of the loop times the number of turns of the loop. The magnetic potential energy is the opposite of the dot product of the magnetic field and the dipole moment. Electronics is the application of electromagnetic (and quantum) theory to construct devices that can perform useful tasks, from as simple as electrical heaters or light bulbs to as complex as the Large Hadron Collider. To discuss electronics we need the basic concepts from electricity: charge, current which is flow of charge, and potential which is the potential energy difference between two places. Please make sure these concepts are familiar before continuing. The interest of electronics is circuits. A circuit consists of wires' that connect components. Typical components are resistors, voltage sources. In order to maintain a constant electrical current a continued exhaustion of chemical or mechanical energy is required. A voltaic cell is a common electromotive power source for a circuit. It consists primarily of two plates, a positive copper plate and a negative zinc plate. One must note that the plates are placed in dilute sulfuric acid. Whence a key is switched or the circuit is closed the zinc reacts with the sulfuric in which it is placed in. One may discern that the electromotive force which is then applied to the circuit is believed to be converted from chemical to electrical energy upon the surface of the zinc cell. Whence the E.M.F is converted from chemical to electrical energy the electromotive force travels through the sulfuric acid. However disadvantages occur whence utilizing a voltaic or galvanic cell. Whence the circuit is closed, simultaneously hydrogen bubbles accumulate upon the copper plate surface hence decreasing the total electromotive power source applied to the circuit in question. The resistance with which the electromotive source encounters as it flows form the zinc plate to the copper plate through the dilute sulfuric acid is distinguished as internal resistance. Hence the voltaic cell uses diluted rather than concentrated sulfuric acid so as to reduce the internal resistance present inside of the component which applies the electromotive force to the circuit. A circuit can be open, when there is a break so that no current can flow, or it can be closed, so that current can flow. These definitions allow us to discuss electronics efficiently. When the Electrons moves through a particular medium in straight without oscillating on their mean position then it is Direct Current. This DC is used in almost every electronical component. Alternating Current on the other hand as the name suggest, the Electrons alter back and forth and hence produces much electrical energy. AC is mainly used to reduce the wastage of electrons and passing much energy at one time. Kirchoff's laws generally hold for direct current (DC) circuits, but fail when dealing with changing electric current and voltage such as alternating current (AC) or signal processing in combination with capacitors, inductors, and antennas. The sum of all the currents entering and leaving any point in a circuit is equal to zero. It is based on the assumption that current flows only in conductors, and that whenever current flows into one end of a conductor it immediately flows out the other end. The sum of all the voltages around the circuit loop is equal to zero. It is based on the assumption that there is no fluctuating magnetic field linking the closed circuit loop. p=work done/time taken p=I*V (current * Voltage) Other Equations for P can also be derived using Ohm's Law, such as P = IR^2, because V=IR, which can be plugged in to get P= I * (IR) and another equation being P = V^2/R. Electronics is the flow of current through semiconductor devices like silicon and germanium. Semiconductor devices are those which behave like conductors at higher temperature. Transistor, diode, SCR are some electronic devices. Light is that range of electromagnetic energy that is visible to the human eye, the visible colors. The optical radiation includes not only the visible range, but a broader range of invisible electromagnetic radiation that could be influenced in its radiation behavior in a similar way as the visible radiation, but needs often other transmitters or receivers for this radiation. Dependent on the kind of experimental question light - optical radiation behaves as a wave or a particle named lightwave or photon. The birth or death of photons needs electrons - electromagnetic charges, that change their energy. The speed of light is fastest in the vacuum. In a wave we have to distinguish between the speed of transport of energy or the speed of the transport of on phase state of a wave of a defined frequency. In vacuum the speed of waves of any photon energy - wavelength is the same, but the transmission speed through material is dependent on wavelength - photon energy. At the time the measurement of the speed of light in vacuum reached the uncertainty of the unit of length, the meter, this basic unit got in 1960 a new definition, based on the unit of time. Taking the best known measurement values it was defined without any uncertainties of length, that the speed of light is 299,792,458 meters per second. For this reason the only uncertainty in the speed of light is the uncertainty of the realization of the unit of time, the second. (If you like to get the standard of length, cooperate with the watchmaker). is the speed of light in the medium. Refraction occurs when light travels from one medium into another (i.e. from air into water). Refraction is the changing of direction of light due to the changing speed of light. Refraction occurs toward the normal when light travels from a medium into a denser medium. Example when light travels from air into a block of glass, light is refracted towards the normal. The ratio between the sine of the angle of the incident ray and sine of the angle of the refracted ray is the same as the ratios of the indexes of refraction. This is known as Snell's Law - an easy way to remember this is that 'Snell' is 'lens' backwards. is negative in convex mirror and concave lens. is positive in concave mirror and convex lens. For a mirror, it is positive if the image appears in front of the mirror. It is negative if the image appears behind. For a lens, it is positive if the image appears on the opposite side of the lens as the light source. It is negative if the image appears on the same side of the lens as the light source. is the distance from the object to the mirror or the lens (always positive). The only case, when it is negative, is the case, when you don't have a real object, but you do have an imaginary object - a converging set of rays from another optical system. 6.4 What does force in motion mean? 6.5 How do we calculate the speed? 6.6 Is velocity the same thing as speed? 6.8 How do we calculate it? 8.1.1 How to calculate the force? 33.2.1 When are scalar and vector compositions essentially the same? While these are indeed common usages, it should be pointed out that there are many other usages and that other letters are used for the same purpose. The reason is quite simple: there are only so many symbols in the Greek and Latin alphabets, and scientists and mathematicians generally do not use symbols from other languages. It is a common trap to associate a symbol exclusively with some particular meaning, rather than learning and understanding the physics and relations behind it. (which has a dot and is much more widely used in mathematics and physics). Been a while since you used logs? Here is a quick refresher for you. Typically, logs use base 10. An increase of "1" in a base 10 log is equivalent to an increase by a power of 10 in normal notation. In logs, "3" is 100 times the size of "1". If the log is written without an explicit base, 10 is (usually) implied. , or some other number. Adding the log of A to the log of B will give the same result as taking the log of the product A times B. Subtracting the log of B from the log of A will give the same result as taking the log of the quotient A divided by B. The log of (A to the Bth power) is equal to the product (B times the log of A). log(8) = log(23) = 3log(2) Vectors are quantities that are characterized by having both a numerical quantity (called the "magnitude" and denoted as |v|) and a direction. Velocity is an example of a vector; it describes the time rated change in position with a numerical quantity (meters per second) as well as indicating the direction of movement. The definition of a vector is any quantity that adds according to the parallelogram law (there are some physical quantities that have magnitude and direction that are not vectors). Scalars are quantities in physics that have no direction. Mass is a scalar; it can describe the quantity of matter with units (kilograms) but does not describe any direction. A scalar times a scalar gives a scalar result. A vector scalar-multiplied by a vector gives a scalar result (called the dot-product). A vector cross-multiplied by a vector gives a vector result (called the cross-product). A vector times a scalar gives a vector result. When are scalar and vector compositions essentially the same? Answer: when multiple vectors are in same direction then we can just add the magnitudes.so, the scalar and vector composition will be same as we do not add the directions. Answer: Let's take gravity as our force. If you jump out of an airplane and fall you will pick up speed. (for simplicity's sake, let's ignore air drag). To work out the kinetic energy at any point you simply multiply the value of the force caused by gravity by the distance moved in the direction of the force. For example, a 180 N boy falling a distance of 10 m will have 1800 J of extra kinetic energy. We say that the man has had 1800 J of work done on him by the force of gravity. Notice that energy is not a vector. It has a value but no direction. Gravity and displacement are vectors. They have a value plus a direction. (In this case, their directions are down and down respectively) The reason we can get a scalar energy from vectors gravity and displacement is because, in this case, they happen to point in the same direction. Gravity acts downwards and displacement is also downwards. When two vectors point in the same direction, you can get the scalar product by just multiplying the value of the two vectors together and ignoring the direction. But what happens if they don't point in the same direction? Consider a man walking up a hill. Obviously it takes energy to do this because you are going against the force of gravity. The steeper the hill, the more energy it takes every step to climb it. This is something we all know unless we live on a salt lake. In a situation like this we can still work out the work done. In the diagram, the green lines represent the displacement. To find out how much work against gravity the man does, we work out the projection of the displacement along the line of action of the force of gravity. In this case it's just the y component of the man's displacement. This is where the cos θ comes in. θ is merely the angle between the velocity vector and the force vector. There is another method of defining the dot product which relies on components. But if the result is a vector, then what is the direction? That too is fairly simple, utilizing a method called the "right-hand rule". 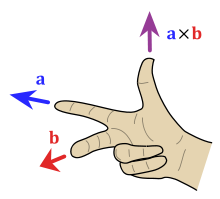 The right-hand rule works as follows: Place your right-hand flat along the first of the two vectors with the palm facing the second vector and your thumb sticking out perpendicular to your hand. Then proceed to curl your hand towards the second vector. The direction that your thumb points is the direction that cross-product vector points! Though this definition is easy to explain visually it is slightly more complicated to calculate than the dot product. Answer: Vectors in the plane of the page are drawn as arrows on the page. A vector that goes into the plane of the screen is typically drawn as circles with an inscribed X. A vector that comes out of the plane of the screen is typically drawn as circles with dots at their centers. The X is meant to represent the fletching on the back of an arrow or dart while the dot is meant to represent the tip of the arrow.